If there’s one take away we want want our readers to have from this article, it’s this — FlexiSPY is the only iPhone monitoring software that supports iOS versions beyond 9.1. Which means if you are a parent or employer who wants to monitor an iPhone, then FlexiSPY is the only option. We’ll publish an in depth article on this later in the month -— but for now, let’s move on the announcement. Today, we are excited to let you know we’ll soon officially support iOS 11.3.1 with tethered mode. And more over, we are offering an exclusive discount on new purchases, and upgrades to those who sign up for our monthly newsletter. To get the discount, simply give us your email address using the form at the end of this post, and we will send you the promo in the next newsletter which you can then use during checkout. 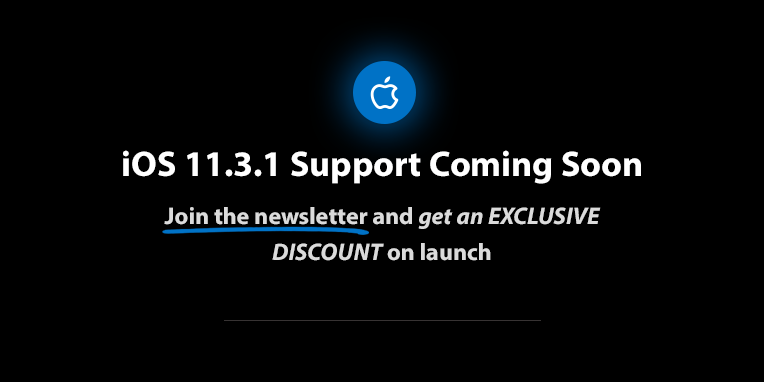 Signup to our newsletter below to be the first to know when we’ve released support for iOS 11.3.1, and to claim your exclusive discount!